I was really excited then to be asked if I would like to review a selection of bibs from Funky Giraffe, a brand which really understands that style and comfort are not concepts which have to be mutually exclusive. Armed with a £15 voucher I was let loose on the website. I knew as soon as the page opened that this was my kind of place - bright colours, cool patterns, and easy navigation. What comes across more than anything is that Funky Giraffe really care about the products they've created, and the individuals who are going to be using them. Check out the 'About Us' section for more on why the brand came into being, and what is important to them now they are established. Next, choosing what to spend the dosh on. 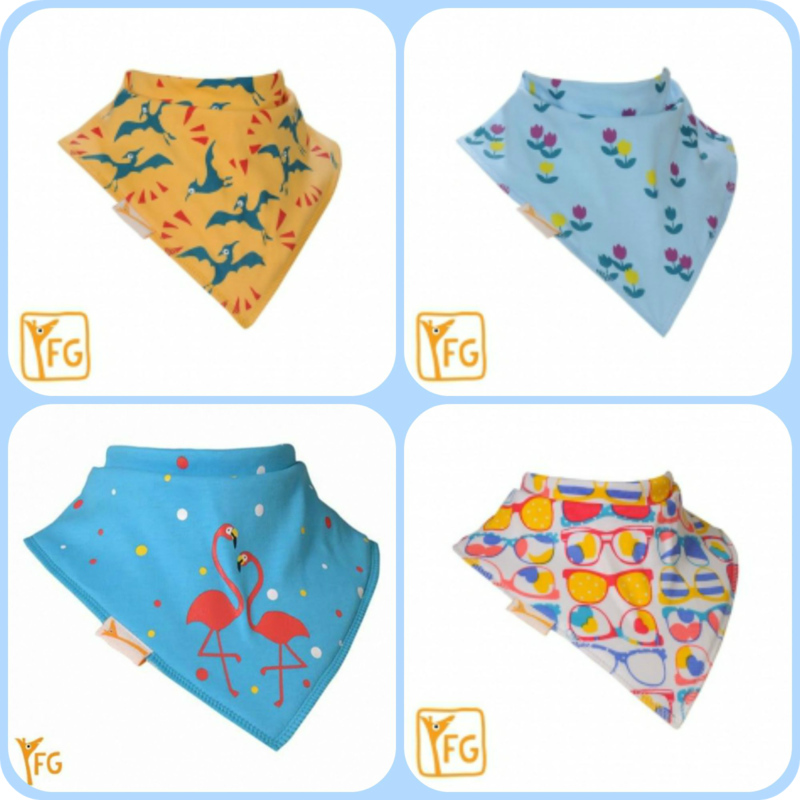 There is more to Funky Giraffe than bibs - they also sell adorable socks, cool scratch mitts, cozy scarves, and trendy burp cloths. Even within the bib section there is plenty of choice. Formal bibs (so cute! 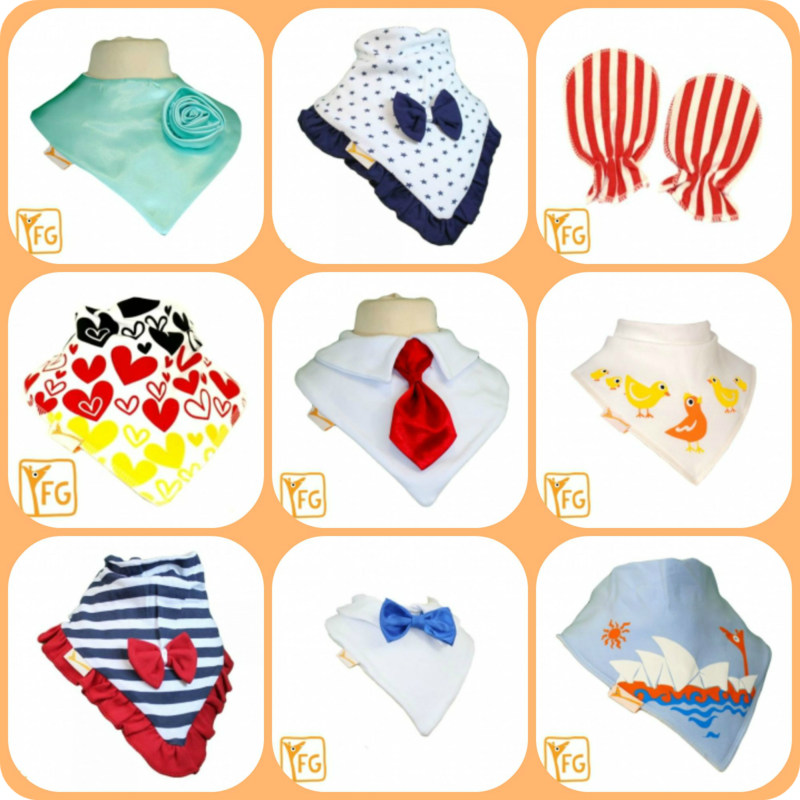 ), bandana bibs, cotton summer bibs, bamboo bibs, personalised bibs, and even bibs with frilly collars. I was also really impressed with their range of larger bandana bibs for 'older children and adults who need dribble protectors'. Everybody deserves the chance to inject a bit of fun and colour into their lives. Some of the cute stuff I didn't buy. If you spend over £7 - and let's face it, how could you not? 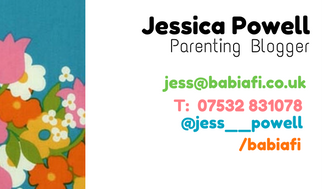 - UK postage is free. EU postage is £3 / £5 (under or over 0.25kg up to 0.5kg - the equivalent of around 25 bandana bibs), worldwide is £3.50 / £6.50. Orders are generally dispatched within 48 hours, and there is a 60 day 'no-quibble' return policy. My order was with me in two days! Once the bibs were here, I couldn't wait to try them out on Marianna. 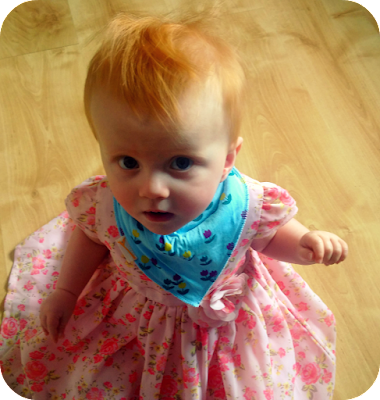 I had been primarily using regular 'din-dins' time bibs with a plastic backing for the purposes of dribbling, but Marianna was far from pleased about the arrangement. While the plastic did make an agreeable scrunching noise, she didn't like the velcro fastening and, as her arms grew stronger, soon learned how to pull the bib off. Some of the designs I chose. The ranges are updated frequently, so it's worth visiting often. 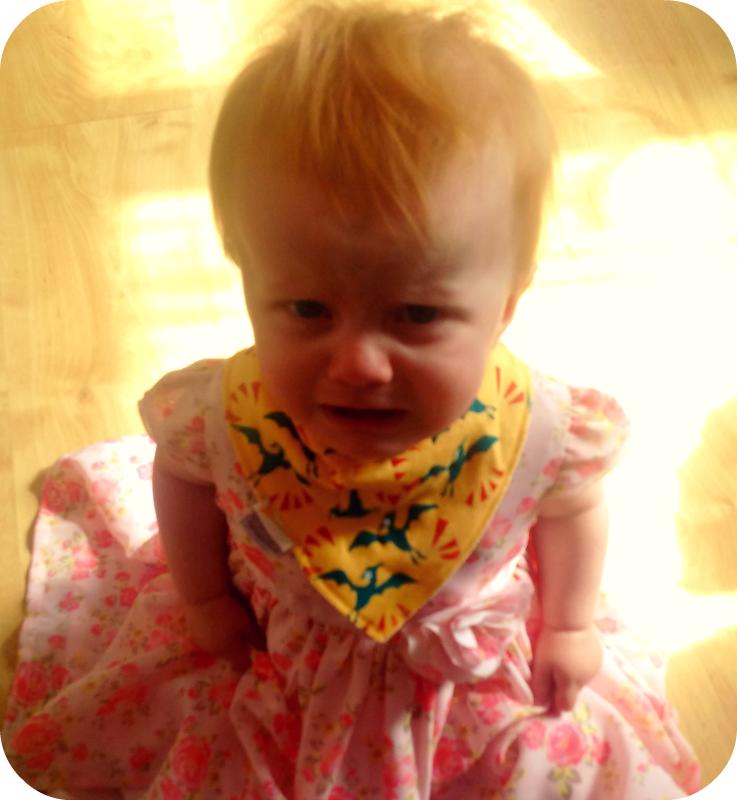 The Funky Giraffe bibs were an entirely different story. They feel really soft and cosy to me, and that must translate because she didn't pull or scratch at them. The fleece backing does the same job as the plastic (far better, I must say, than the fleece backing on the supermarket dribble bibs we had), but without being uncomfortable. Instead of velcro they have a double popper fastening which is more secure, gives a bit of growth room, and doesn't destroy your tights in the washing machine. And talking of washing, they wash really well. We've been using them for over three weeks now - allowing for a dozen or so washes - and they still look fresh and vibrant. If I ironed them they would look like new, but that would be a step too far for a houseworkphobic mum like myself. 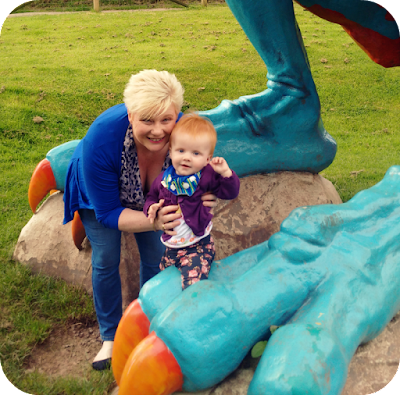 Modelling Funky Giraffe with my mum at Greenmeadow Community Farm. Marianna isn't giving up hers, but you can buy your own from funkygiraffebibs.co.uk. 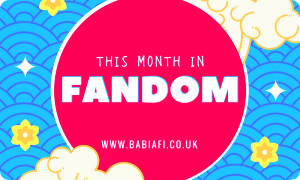 If you're from outside the UK, you can also check out funkygiraffe.com.au (Australia), funkygiraffe.fr (France), and groovigee.com (USA). Click the symbols for all the Funky Giraffe social media goodness. 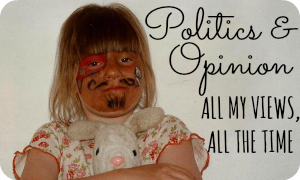 You can also subscribe to the newsletter HERE. T&Cs: Open to UK entrants only. Prize is one set of ten Funky Giraffe bibs chosen at random - no alternatives or cash equivalent offered. Winner will be notified by email and have one week to respond with their postal details. Prize will be sent by Funky Giraffe. Like the idea of winning stuff? Check out my other giveaways HERE. :D It took me ages to pick! I love the blue seahorse bib so cute! That's such a lovely print! It's such a funky print, isn't it? I love the purple chickens and chicks one! I'm a bit biased 'cos I picked that print too, but it is really cool! Love the Red & Blue stripes Cutie Collar Bib!! It's such a cool print! That sounds like some very cool wallpaper! I love them all but the Seahorse one is cute. It's a really lovely print. I like the grey rabbit. I'd love the seahorse print as bathroom wallpaper or something! Aw, that one's so sweet. I love that one too, it's very pop art! The Blue & White Marine Stripes XL Bandana Bib. Love the striped ones, they look very cool. That one's so fun and vibrant! I know, I'd be really hard pushed to pick just one! Even the ones we have feel so soft - I can definitely see the attraction! :D It is a really lovely design. That design really is funky! :D I'm a sucker for anything with stars on! :D Gotta love the stars. My love the White and Blue Penguin bib! It's tough to choose one but I really like this Cream Caterpillars Cotton Bandana Bib! The sunglasses one is my fav. I like the piggy one! There are so many cute designs but I love the white autumn hedgehog! I love the smart little tie bibs! @PeanutHog - I love the navy Plain XXL Personalised Cotton Bib - It is unique and would make a great gift. Also nice and big to pick up all the mess and dark in colour to hide all the mess!!! Gosh how do you choose! So many lush prints! I love the space designs, especially the peeking aliens! I love the white and pink spots. Thanks for having me! :) They're great, and are holding up really well.